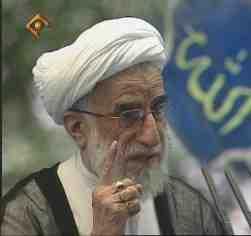 Ayatollah Jannati, the secretary of the all powerful unelected Guardian Council in the Islamic Republic, held the Tehran Friday prayers sermon today. On the nuclear issue, he said "whatever obstacles they try to put in our way they will fail. We are now in a good position to get what we want. All we need is a man of action." He also expressed his satisfaction at the impending establishment of an Islamic Republic in Iraq, saying "This shows the freedom loving people of the world are aware of the high standards in the Islamic Republic and seek our system as a paradigm"
He ended his sermon by expressing his jubilation at the imminent coming of the 12th Imam.